Naomi has a terrible habit of interfering with Death—an unforgivable flaw for a Grim. In order to complete her tasks, she must live among Humans for weeks at a time. When Naomi is assigned a job at Jefferson High, she quickly becomes attached to the kids she’s been assigned to watch over. Knowing that her new friends are going die under less than ideal circumstances, she has the opportunity to prevent their deaths from occurring. Only one big problem, interfering with death is the worst crime a Grim can commit. If she intervenes, she’ll put herself and her family in danger. 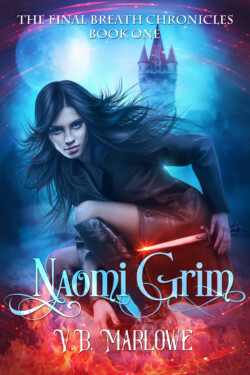 Naomi must make the hardest choice she’s ever had to make, go against the sacred covenant or watch her new friends walk blindly to their deaths. Naomi must maneuver her way around traitors, life-changing secrets, and a nasty rebellion brewing back at home.